What is Social Solutions Apricot? 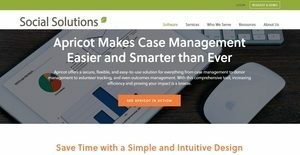 Social Solutions Apricot is a case management software exclusively designed for nonprofit and public sector agencies that are offering social services to communities. These agencies, whether small teams or multi-service organizations, are offering services which include health and human services, workforce services, reentry services, child and family services, homeless services, foundations and funders, and victims’ services. Apricot is a part of Social Solutions’ suite of nonprofit software solutions which provide tools to organizations, so they will be able to accelerate the progress of their programs and services. Flexible, comprehensive, and intuitive; Apricot offers a case management system which allows users to create dynamic reports and obtain data to track the progress of their programs and measure their outcomes. They will also be able to add and edit forms and fields on the fly in order for them to filter their data and gain better insights on their programs. The nonprofit software also provides a volunteer management feature, which enables users to easily track their volunteers and clients. Last but not the least, it organizes all their schedules in one place and helps them process program enrollment with ease. The reporting capabilities of Apricot are excellent. Users will be able to create reports easily for their clients and funders through the aid of its drag-and-drop functionality. Functioning as a reporting platform, Apricot also aids users to prove the outcomes and impact of their programs by allowing them to share dynamic reports with their clients. With dynamic graphs and heat maps, they will be able to visualize their data and show to their clients the needs of the communities and populations they are serving. The case management software moreover enables users to track the progress and performance of their programs and services. They will be able to obtain insights on how they are delivering their services and how their programs are attaining their goal and mission. In addition, Apricot aims to eliminate paper-based documentation and filing as well as data entry duplication. They will be able to create and publish release forms instantly, and the software will help them efficiently process service referrals and program enrollment. To promote accurate data management, Apricot offers built-in data validation tools. With these tools, users will be ensured that forms are filled out completely, right information are entered on fields, and there are no duplicate data. Apricot also highlights is volunteer management feature. With this feature, users will be able to track their volunteers and their clients. This feature is equipped with guest user modules, which they can use to improve their communication and engagement with their volunteers and clients. If you are considering Social Solutions Apricot it might also be sensible to examine other subcategories of Best Business Process Management Software collected in our database of B2B software reviews. Every enterprise has its own characteristics, and might need a particular type of Business Process Management Software solution that will be adjusted to their company size, type of customers and employees and even particular niche they deal with. We advise you don't count on getting a perfect app that is going to work for every business regardless of their history is. It may be a good idea to read a few Social Solutions Apricot reviews first and even then you should keep in mind what the solution is supposed to do for your company and your workers. Do you need a simple and intuitive service with just basic features? Will you actually make use of the advanced functionalities required by pros and big enterprises? Are there any specific tools that are especially beneficial for the industry you work in? If you ask yourself these questions it will be much easier to find a solid app that will match your budget. How Much Does Social Solutions Apricot Cost? We realize that when you make a decision to buy Business Process Management Software it’s important not only to see how experts evaluate it in their reviews, but also to find out if the real people and companies that buy it are actually satisfied with the product. That’s why we’ve created our behavior-based Customer Satisfaction Algorithm™ that gathers customer reviews, comments and Social Solutions Apricot reviews across a wide range of social media sites. The data is then presented in an easy to digest form showing how many people had positive and negative experience with Social Solutions Apricot. With that information at hand you should be equipped to make an informed buying decision that you won’t regret. What are Social Solutions Apricot pricing details? What integrations are available for Social Solutions Apricot?